Tobacco budworm (Heliothis virescens) larvae feed on tobacco foliage in the bud preflowering and on flowers pretopping. Corn earworm larvae (Helicoverpa zea) may also be present in tobacco, and these 2 species are difficult to distinguish between as larvae without magnification. See the below video for a guide to differentiate between these species. Tobacco budworm feeding results in holes in foliage (Type 1 Damage) and can destroy flowers and seed capsules, in seed production. In some cases, tobacco budworm feeding can result in destruction of the apical growth point, prematurely topping the plant (Type 2 Damage). Type 1 Damage is the most common type of tobacco budworm damage, and this type of feeding does not typically results in measurable yield loss. This is because budworm injury occurs prior to topping, while plants are still growing. 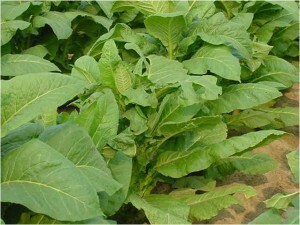 The plant can compensate for the weight loss to tobacco budworm feeding. Type 2 Damage is of greater economic concern, because it potentially increases labor costs for sucker control. Type 2 Damage, however, is much rarer than Type 1 Damage. Research is ongoing to determine if there are factors that favor Type 2 Damage and to revise treatment thresholds to take this type of damage into account. Type 1 budworm damage is simple leaf and bud feeding. 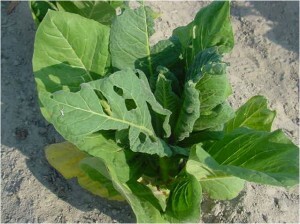 Tobacco budworm adults emerge in late spring, and larvae do not begin to appear in tobacco until roughly 4 weeks after transplant. There are typically 4 generations per year in North Carolina. Larvae progress through 5 to 6 instars, and development takes between 21 to 25 days. Tobacco budworms overwinter as pupae in the soil. Cotton and soybeans also serve as hosts for tobacco budworm larvae. Corn earworms have a broader crop host range. Tobacco budworm moth. 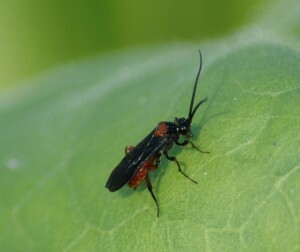 Photo by Clyde Sorenson, NC State University Department of Entomology. 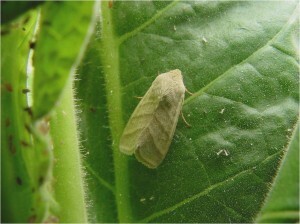 Before the crop flowers, treat when 10 percent or more of plants checked are infested with budworms. See information on how to scout for tobacco budworm larvae. Do not count plants that have damage but no live worms. Budworms will not usually cause significant loss after buttoning and should not be counted after that time. If budworm populations are at or near threshold but plants will be topped within 2 weeks, treatment is not recommended because limited damage will occur before topping and after topping, budworm are no longer a pest. Timely topping will reduce budworm populations and damage. This threshold is extremely conservative; based on much recent research, tobacco budworms must generally reach much higher populations to cause economic loss under the growing conditions found in most of North Carolina. See the North Carolina Agricultural Chemicals Manual for registered materials, rates, and applications recommendations. The parasitic wasp Campoletis sonorensis (Cameron) (Ichneumonidae) kills small budworms while another parasitic wasp Cardiochiles nigriceps Viereck (Braconidae) kills large budworms near pupation. Predators include several Polistes spp. paper wasps which will kill larvae to feed to their larvae.